After securing a thrilling Treble with last month's Champions League final victory over Juventus, you might think Barcelona's powers-that-be would allow themselves the luxury of a summer relaxing on the sunny beaches of the Costa Brava. But this is Barca, a place where no day is dull and every interlude merely provides an opportunity for the latest controversy to erupt. BBC Sport takes a look at another busy off-season for the Spanish and European champions and Copa del Rey winners - which is by no means over yet. The start of the summer break was notable for a U-turn by defender Dani Alves, who ended the season claiming he would almost certainly leave and berating the club's board for supposedly disrespecting him. Within days of the Champions League final in Berlin, Alves changed his mind and agreed a new two-year contract - a welcome development for forward Lionel Messi, who has received more assists from the rampaging Brazilian full-back than any other player. Alves's unexpected stay was not particularly good news for energetic winger/full-back Aleix Vidal, who had just joined from Sevilla on the assumption Alves would be leaving. There was also a new two-year deal for boss Luis Enrique, who had earlier slightly dampened his team's trophy celebrations by claiming not to know whether he would still be at the club next season. More recently, Barca have closed in on Juventus midfielder and former Manchester United trainee Paul Pogba, who is being chased by practically every leading club in Europe. The Catalan giants appear to be in the driving seat after two members of their technical staff held a cordial meeting with Juve's key decision-makers. But Barca's most controversial move of the summer - for reasons that will be explained later - was their swoop for Atletico Madrid's classy playmaker Arda Turan, who has signed a five-year contract after the clubs agreed an initial fee of £24m, potentially rising to £28.5m (34-41m euros). One complication is neither Turan nor Vidal can make their debuts until January, because Barca are serving a Fifa transfer ban after being found guilty of transgressing regulations on signing young players from overseas. Players can join the club, but not be registered for competitive action. The ban was first announced in April 2014 but a temporary reprieve during the appeal process - which Barca subsequently lost - allowed them to recruit several key performers, including Champions League final goalscorers Luis Suarez and Ivan Rakitic, last summer. Looming large over everything else at the Nou Camp this summer is the forthcoming presidential election, which will take place on Saturday. Josep Maria Bartomeu is hoping for re-election after ceremonially resigning last month, as required by the club's constitution, to allow an interim board to take charge during the run-up to the election. Despite last season's successes, Bartomeu is far from universally popular and it is easy to build a case against both him and the previous president he worked alongside and eventually replaced in January 2014, Sandro Rosell. In addition to the transfer ban, during their stewardship the club has been accused of dodging tax on the signing of Neymar and ending their much-lauded policy of reserving shirt sponsorships for children's charity Unicef by siding with Qatar Airways, which is owned by the much-criticised Qatari government. Bartomeu (left, at the unveiling of Neymar) told Marca: "This year we will not sign Pogba because he is not part of our sporting plans"
Critics say those episodes have betrayed Barca's famous 'More Than A Club' motto and undermined their cherished image as the good guys of professional football. The most extreme criticism came from another presidential candidate, Agusti Benedito, who has argued that Barca are effectively supporting global terrorism by aligning themselves with a government which has been accused of providing funding for the Islamic State group. But Bartomeu is equally adamant that Barca have been victims of a high-level Madrid-based conspiracy as punishment for the club's support for Catalan independence - the hottest political potato within Spain in the past couple of years. More than a club, indeed. The recent signing of Turan is a highly controversial move - and not just because the club has paid up to 41m euros for a player who will be 29 by the time he makes his debut. The bone of contention is revealed in the transfer's exceptionally unusual 'sell-back' clause, whereby Barca have reserved the right to return Turan to Atletico by midnight on Monday, 20 July. That is because club conventions dictate no major transfers can be made during the run-up to an election, when only an interim board is in charge and therefore lacks the authority to invest significant sums in new players. Arda Turan said: "It's going to be hard not playing for six months but the important thing is that I will play for Barca"
But Turan had been specifically requested by manager Luis Enrique, and Bartomeu exerted heavy pressure to ensure the deal was pushed through before it could be hijacked by Chelsea or Paris St-Germain. While the other presidential candidates wanted to wait until after the election to complete the deal, Bartomeu insisted that it happened sooner, leading to reports that interim president Ramon Adell was considering resigning in protest at the pressure he was receiving. In the end, Bartomeu won the day with a persuasive argument that a manager who has just won the Treble should be given backing, and a compromise was reached with the sell-back clause, which would allow the new president to cancel the deal and get 90% of their money back. Bartomeu's willingness to contravene club norms angered the other candidates and one of them, Joan Laporta, had initially stated he was unsure whether he would proceed with the deal to sign Turan if he wins. Ah, Joan Laporta. The name will already be familiar to followers of Spanish football thanks to his colourful seven-year stint as Barca president between 2003 and 2010, when he had to resign after serving the maximum possible term. 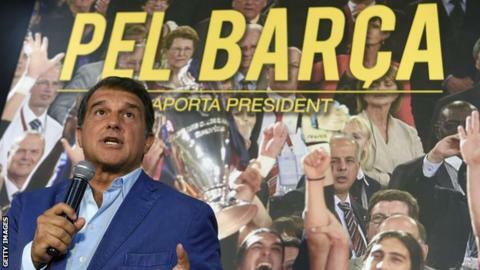 Now Laporta is back for more and, although there are five candidates in total, the election campaign is widely regarded as a two-horse race between Laporta and Bartomeu. Laporta oversaw enormous playing success during his previous spell at the helm and maintains widespread support from fans and heavyweight famous names alike, with former manager Pep Guardiola already publicly expressing his backing for the man who hired him in 2008. Two more influential supporters of the Laporta cause are former player and manager Johan Cruyff, arguably the most important figure in the club's history, and Eric Abidal, the Frenchman who generated huge affection among fans by successfully battling cancer during his playing spell at the Nou Camp. Abidal will be appointed sporting director in the event of a win for Laporta, who is also believed to enjoy the support of the dressing room. Last month he claimed to have a "telepathic" relationship with Lionel Messi. In common with the other candidates - except Bartomeu, of course - Laporta has promised to end the club's commercial association with Qatar, pledging to return the shirt sponsorship to Unicef. But Bartomeu uses this stance as an example of Laporta's greatest perceived weakness: the financial problems generated during his previous presidency, also highlighted by the disastrous move for Zlatan Ibrahimovic in 2009. The Swedish striker was subsequently loaned out one season later and then sold to AC Milan at a loss of about £30m. Nobody knows, but it's certainly set to be a much closer contest than expected a few months ago when Laporta was predicted to wipe the floor with Bartomeu. Last season's Treble triumph has significantly strengthened Bartomeu's hand, and it was notable that he gained nearly double the number of supporting signatures as Laporta in the formal process, concluded last week, which confirms a candidate's eligibility. Bartomeu is also playing a clever fight by focusing his efforts on the people who will actually make the decision: the club's members. To simplify, many of them are ageing and conservative Catalan men who don't care too much about the club's global reputation, eagerly swallow the Madrid conspiracy stories and are worried by the prospect of Laporta overspending the club back into heavy debt. The only confident prediction is that more mud will be slung, and it's also likely that the candidates - certainly the leading pair - are keeping a bombshell up their sleeves to drop in the final hours of the campaign. Laporta announcing Guardiola's return? Bartomeu revealing a deal to sign Pogba? Messi claiming he will leave if Bartomeu wins? Don't rule it out - in the highly political world of FC Barcelona, anything is possible. Is this the greatest Barcelona team?